Hotel Arts is continually innovating the look and feel of our property to align with the evolving tastes of our guests that are seeking new conveniences and unique accommodations. April 27, 2018 (Calgary) – Hotel Arts is proud to announce the completion of a major renovation of 28 Studio guestrooms, giving their basic room category a design and functionality upgrade. 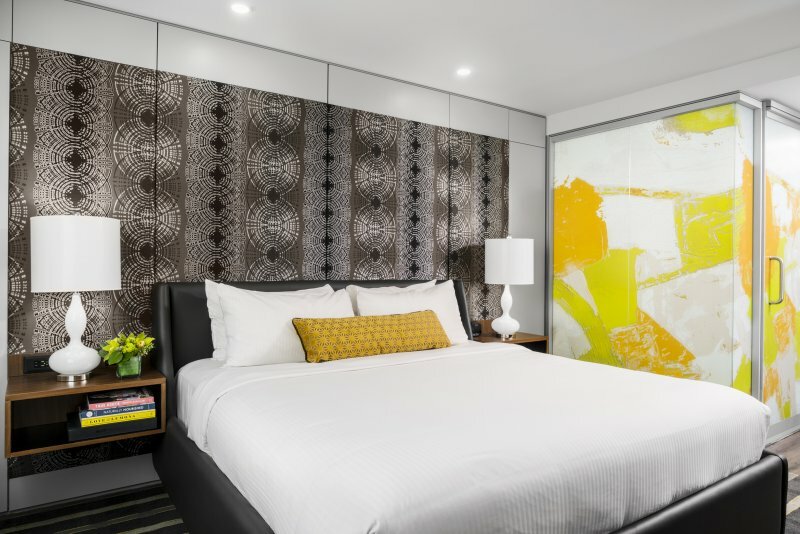 Working with award-winning B&H CHIL Design and Calgary-based DIRTT Solutions, the newly unveiled Studio Rooms are an innovative product that provides guests with a stylish, comfortable hospitality experience. This renovation completes the transition to a consistent style throughout all rooms of the property, highlighting bright décor, enhanced functionality and artful touches throughout. Here’s a great video DIRTT produced about these rooms that will provide a better overview of this modular construction design. Watch the video that we’ve uploaded to our YouTube Page. B&H CHIL Design won awards for their previous work with Hotel Arts on a $7M renovation of the Luxury Tower in 2015. They were tasked with incorporating the style aesthetics from the Luxury Tower into the panel modular construction of DIRTT Solutions. In the newly renovated Studio Rooms, guests can expect a contemporary, art-focused design with practical room layout. Visitors will enjoy inviting king-sized beds with our signature headboards, accessible power and USB ports, dimmable lighting, blackout blinds, in-room safes, ample storage in addition to a number of other modern amenities. The bathroom features a rain shower and toilet enclosed in a glass cube with a bright, bold art overlay designed by Farmboy. A well-lit vanity with pedestal sink is flanked by custom millwork with a full-length wardrobe with mirror, bench seating and work desk. New windows were also installed brightening up the rooms considerably as well as reducing exterior noise. Situated at the heart of Calgary’s art and entertainment scene, Hotel Arts offers a unique and refreshing connection to the city. Style-driven, the boutique property features modern décor and designer touches throughout with an extensive professionally-curated art collection. Home to versatile conference and event space and two onsite award-winning restaurants, Yellow Door Bistro and Raw Bar, offer unique and innovative dining experiences to guest and locals alike. Seasonal outdoor pool is an urban oasis including a food and beverage serviced poolside patio. During the summer months, complimentary cruiser bikes are available to guests to explore the city along Calgary’s extensive bike paths to which Hotel Arts is connected. Defined by the combination of local connection, boutique experiences, culinary delights, visual arts and exceptional customer service all driven by passionate employees who work to create an extraordinary guest experience. For more information, please visit www.hotelarts.ca. DIRTT is a leading technology-driven manufacturer of highly customized interiors with global headquarters based in Calgary. DIRTT combines its proprietary ICE® 3D design, configuration and manufacturing software with integrated in-house manufacturing of its innovative prefabricated interior construction solutions and an extensive Distribution Partner network across two continents. For more information, please visit https://www.dirtt.net. CHIL Interior Design is the hospitality studio of B+H, a global leader in interior design, architecture, and planning & landscape. CHIL Interior Design creates unparalleled hospitality experiences. For more information, please visit https://www.childesign.com. Farmboy Fine Arts (FBFA) is a full-service art consultancy, delivering custom artwork and curated collections for hospitality, healthcare and corporate spaces. Farmboy provided the artwork for the guestrooms and elevator landings at Hotel Arts. For more information, please visit https://farmboyfinearts.com/.